This week we’re thrilled to bring you the latest installment of our Packaging the Future compost tests, where we break down the real-life biodegradability of eco packaging. Although I started this series expecting less than stellar results (what with all the nay-saying regarding biodegradable packaging), I am now pleasantly surprised to say that we are two for two! This week we put the compostable Bambu brand bamboo plate to the test and found that it really does break down quite nicely – hit the jump for our in-depth report! I took the above picture on July 8, 2010, just a few minutes before I added the plate to my backyard compost (which, as previously detailed, is far from ideal; I pretty much just throw my kitchen scraps and other compostables on the pile and mix it up with leaves and other garden detritus. I’m not a hard-core composter, so this test is imperfect in that there would be different results if one were to try it in a more well-turned, ventilated, balanced and paid-attention-to compost heap. However, my admittedly haphazard approach to composting has an advantage, which is to show what would likely happen if any of the materials I am testing makes its way into the environment (in other words, becomes litter). Because, after all, unless someone is composting in their backyard like me, or has compost pickup in their city (like Seattle, San Francisco and London), most compostables end up in the landfill, where, due to the lack of oxygen, they won’t break down. The anaerobic conditions disallow bacteria, molds and insects to do their important work, and so even the most biodegradable stuff in the world will remain intact for decades (cue 30 year-old banana peels). 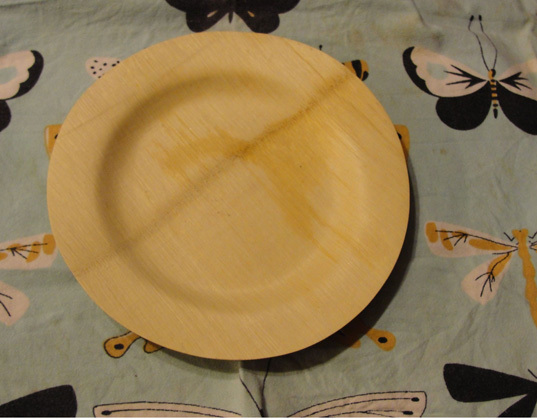 After 3 1/2 months, the bamboo plate is rotting pretty well; the mold is breaking down the right side, while the left side is peeling apart and breaking off into the compost heap. The Bambu plate, while not breaking down as fast as the Whole Foods container, is on its way to turning into soil. 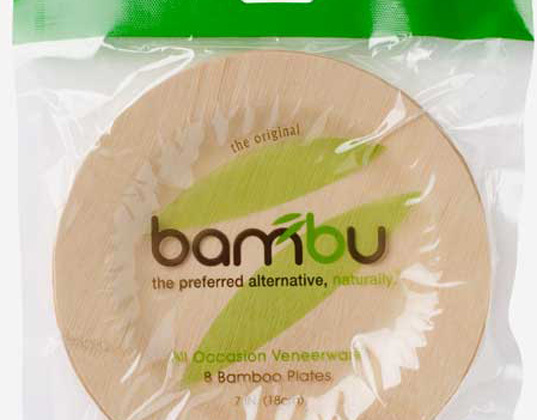 While there are some environmental issues associated with bamboo crops, such as artificially accelerated growing techniques and the supplanting of old growth forests, Bambu says their plates are made from 100% organic bamboo, which generally comes from well-managed bamboo stands. Since it’s thicker and more rigid than the Whole Foods container, and made from bamboo peeled directly from the stalk, it makes sense that it would take longer to degrade. However the issue raised about still stands: why do compostables matter if most of them won’t be composted? There are two main reasons. The first is litter; when plastics make their way into the environment, they don’t ever really break down into natural constituents; they just become smaller and smaller pieces of plastic. 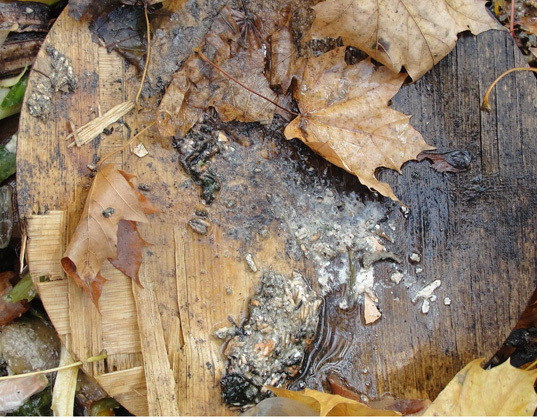 These bits often make their way into waterways where animals ingest (or try to ingest) them, blocking their digestive track and killing them quickly. They may also absorb the chemicals the plastic is made from, killing them slowly. When we eat fish that has been snacking on plastic pieces, we end up with those toxins in our bodies too. Then there’s leaching. When compostable packages eventually (eventually!) break down in a landfill, they are reduced to natural constituents like cellulose or bamboo fiber. When plastic is stuck in a landfill, it will, over time, leach the toxic chemicals used to make the container, which can eventually work its way into local water tables. Yep, that means that we (or the animals we eat) end up drinking that water. So the real reason that compostables are better than plastic is that they are better for the health of human beings (and other animals). Over time, they also take up less space in landfills. And that’s only looking at the disposal part of the cycle; a quick look at how a plastic plate is made, versus how one is made from natural materials that biodegrade, shows that the creation process for plastics creates more toxic waste too (though due to the size of production facilities — essentially the scale of production — plastics may use less energy to create). I know, it’s a lot to think about the next time you get your friends together for chips and drinks and you’re looking for some plates for the apps. I would definitely buy Bambu plates if I absolutely HAD to use disposables. But if you want to save money and really be environmentally friendly, use real dishes and get your friends to help you wash up. A lot of our conveniences are just that — not really necessary. I regularly entertain both indoors and out, and I use the real stuff when I do. If you are afraid of ruining your plates or kids breaking them, consider thirfting some extra plates (Goodwill always has fun prints available that you can mix and match) and storing them for parties. Disposable ANYthing is never as good as reusable objects, at least when it comes to the planet. 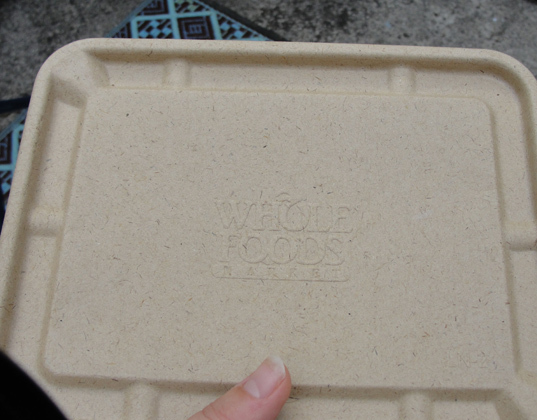 Finally, an update on our previous testee: the Whole Foods take-away container. Basically, it has lost all resemblance to its box shape and has broken into little pieces. I expect in a couple more months it will have integrated itself into my other compost, and will be helping to grow my first greens next Spring. (This is a nice thought as I harvested the last of the hardy greens from my Connecticut garden following a spate of hail this morning). love these, i'm going to try them out at the next dinner party i have. love to see the real "break down" on this issue! I always wanted to buy these but was never sure if they'd really break down. Now I know. Thanks Starre! This week we're thrilled to bring you the latest installment of our Packaging the Future compost tests, where we break down the real-life biodegradability of eco packaging. Although I started this series expecting less than stellar results (what with all the nay-saying regarding biodegradable packaging), I am now pleasantly surprised to say that we are two for two! This week we put the compostable Bambu brand bamboo plate to the test and found that it really does break down quite nicely - hit the jump for our in-depth report!